So good I wish there were leftovers. I looked in my fridge yesterday, and saw an eggplant leftover from when I went fruit and veggie-picking two weeks ago. I also found a container of full of a fried breadcrumb mixture. (What was it exactly? I had made some fried potato patties several weeks ago, and had leftover egg and breakcrumb mixtures, so I had put them together, fried them up, and stuck them in the fridge. Food waste. I avoid it.) 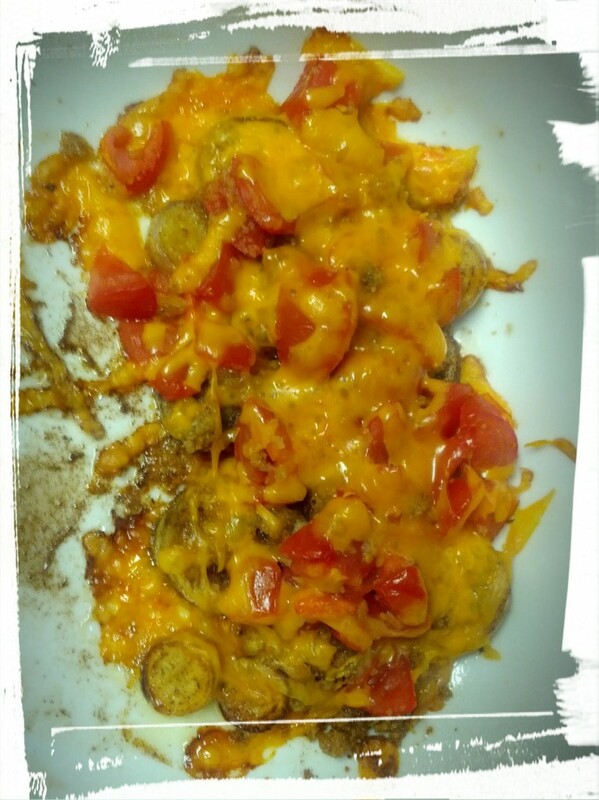 I looked deeper into the recesses of my fridge: I had some tomatoes that were going to get shriveled if I didn’t eat them in a day or so, and I always have a drawer full of cheese (lactose-free for me, lactose-full for the DH). I looked at my fridge. My fridge looked at me. And Single Serving Eggplant Parm was born! Technically, it’s not Eggplant Parmesan because there’s no parmesan cheese, and really, I should have used mozzarella, but I had a block of cheddar cheese open, and since I’m all about using what you’ve got, I made do! I call this Single Serving Eggplant Parm, because it will serve a single hearty eater…or two people if you add a couple of sides. It’s easy to increase the quantity and make additional servings. Just play around with your food some! Some of the tasty ingredients! Slice your eggplant. Sprinkle with salt to draw out the bitter juices and let sit for 10 minutes. Grate cheese and chop tomatoes while waiting. You’ll know the eggplant is ready when you can see the bitter juices beading on the eggplant. Rinse the juices and the salt off the eggplant. Fry eggplant until golden on each side. Place eggplant in a layer in a greased baking dish. Sprinkle breadcrumbs on top. 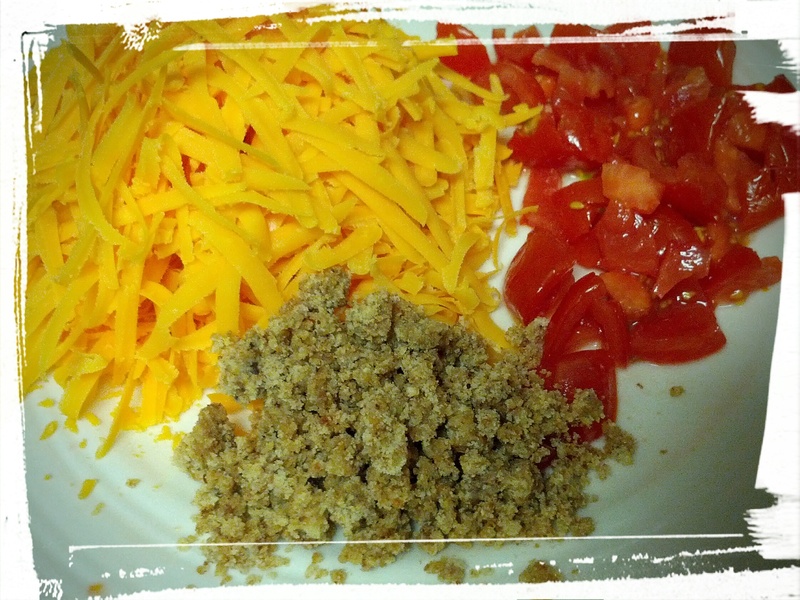 Layer chopped tomatoes over the breadcrumbs, and sprinkle the grated cheese over it all. Baked in a 350 degree oven until cheese is golden and bubbly on top, about 15 minutes. Serve and feel smug about turning leftovers into deliciousness! The finished baked dish: not super purdy, but tastes heavenly! I served this Eggplant Parm to the DH yesterday, along with steamed broccoli with cheese sauce, and a broccoli coleslaw. After the first bite, he asked if there was any leftover for him to take to work for lunch the next day. I think that means the recipe was a success! If you make it, let me know, and also let me know how you use up YOUR leftovers! Any fave recipes to share? 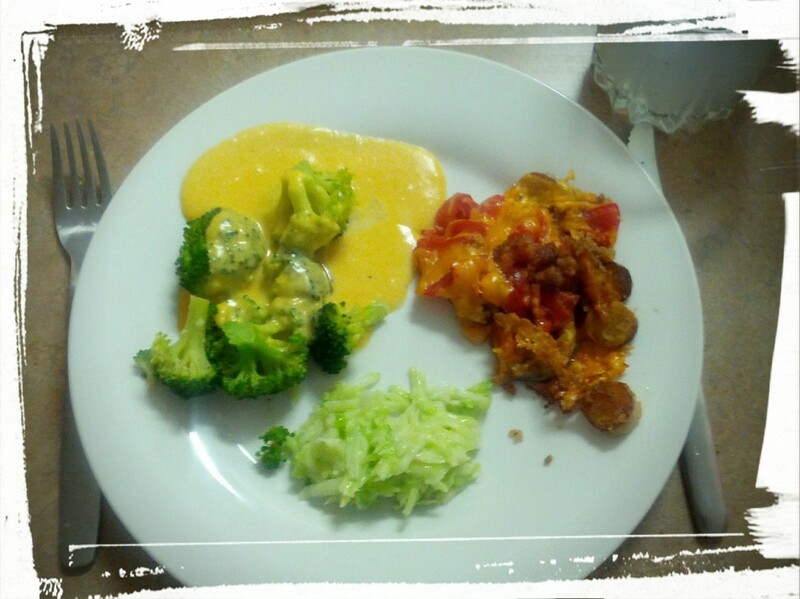 This entry was posted in Vegetarian Main Dishes, Vegetarian Side Dishes on October 15, 2014 by Margaret.